The RM-4100S RecMic II is created to cater to the highest demands of professionals who want the best usability and results with any speech-to-text solution. The RM-4100S also comes with an extra smooth UV-coating and silent buttons to reduce disturbing touch noises. The device is equipped with an antimicrobial surface meeting hygienic requirements, especially when used in medical environments. 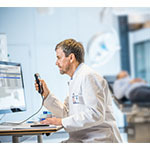 Olympus Dictation Management System (ODMS) Software for easy speech documentation.There are various ways to convert your dictation into a transcribed text. In collaboration with a transcriptionist, speech recognition software or a combination of both. Quickly and easily share dictation files via email, a shared folder or FTP. Automatic and manual tagging of your dictations makes the workflow fast and secure. Keep an eye on your workflow with status updates. 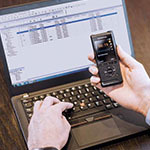 When combined with the DS-9500, you can monitor the progress of every dictation at any time even on the mobile voice recorder, freeing your mind for other tasks. In the list view of ODMS, you can also prioritise important dictations and make your workflow more transparent and effective. Creates dedicated author profiles for each language package/Dragon user profile. 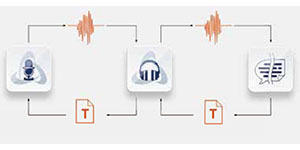 This enables transcription of dictations in a variety of different languages (desired Dragon language package must be purchased and installed separately). Software and hardware can be centrally managed in a web browser. Individual user configurations are easy to manage. (Administration Package must be purchased separately in addition to ODMS Dictation and Transcription modules). 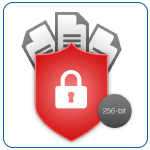 256-bit AES encryption protects your dictations. After completing your dictation, send it directly to a typist. Once transcribed, it is returned to you as a text file. In combination with ODMS and Dragon speech recognition software (sold and installed separately) manual transcription is no longer required. 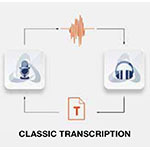 The Dragon software automatically transcribes the dictation. 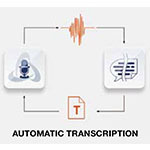 When you send your file to a transcriptionist who is using Dragon (sold and installed separately) speech recognition software, the dictation gets automatically transcribed. The typist needs only to proofread and return the text file. Any corrections made will train the users speech recognition profile. Spending too much time helping colleagues with software support? Need assistance setting up a documentation workflow? Looking for training on how to use your software more efficiently? Learn more about our support options.